After years of brewing speculation, Anheuser-Busch InBev has at last approached rival SABMiller about a takeover that would create the world’s largest beer company by a long shot – worth around $280 billion. A deal would crown years of global consolidation of the brewing industry and spark a climactic round of regional disposals, spins and amalgamations. With a market value of 59 billion pounds ($91 billion), SAB would be the biggest acquisition yet by Carlos Brito, the Brazilian chief executive. Starting with a regional player in Latin America supported by the wily founders of 3G Capital, Brito merged with the Belgian brewer of Stella Artois, InBev, and eventually purchased the maker of Budweiser six years ago. Brito’s skill at cost-cutting is allowing Anheuser, the brewer of Budweiser, to turn nearly 40 percent of its revenue into EBITDA in the current year, according to Eikon data. That’s nearly twice the peer median. SABMiller, led by Alan Clark, has a 30 percent EBITDA margin, although it is fast improving. Heineken and Carlsberg trail at 23 percent and 20 percent, respectively. This track record may give Anheuser investors confidence to fund the deal, which at a 35 percent premium to SAB’s undisturbed stock price would come in at $100 billion. SABMiller is 41 percent held by two large shareholders, U.S. tobacco group Altria and Colombia’s Santo Domingo family, who would be likely to accept equity in the combination. That still leaves Anheuser needing to find another $59 billion or so to get the deal done. However, gaining approval from antitrust watchdogs may be more complicated than appeasing shareholders. In the United States, Anheuser would almost certainly need to flog its 58 percent stake in the MillerCoors joint venture, presumably to partner Molson Coors. In China, SAB’s Snow brand may also need to find a new owner. These and other mandatory disposals might give opportunities to Heineken, Carlsberg and Diageo, owner of Guinness. Equally, the financial returns generated by “ABSAB” might force Heineken and Carlsberg – controlled by a family and a foundation, respectively – to reconsider their own market positions. Whatever the case, a successful ABSAB will froth up Big Beer like never before. What's next on Carlos Brito's shopping list? Anheuser-Busch InBev has made a takeover approach for SABMiller, according to statements from both companies on Sept. 16. Shares in SABMiller rose 20 percent to 36.33 pounds. 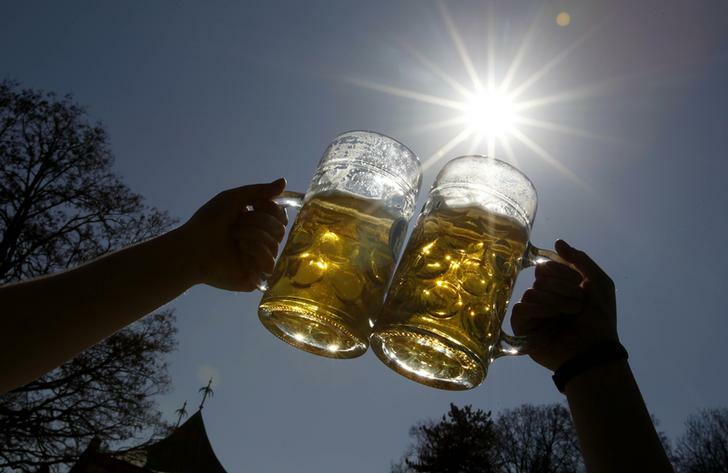 AB InBev stock climbed 7.4 percent to 101.45 euros. Together, the two companies have a market value of approximately $280 billion. SAB is being advised by Robey Warshaw, JPMorgan and Morgan Stanley. Lazard is working with Anheuser, according to the Wall Street Journal.